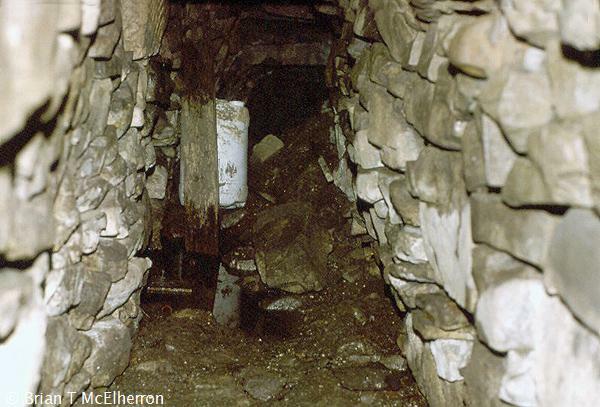 Killala Souterrain (G204298) was investigated. The entrance is through a hole in the roof of a beehive chamber. To the left is a small short passage which may be a ventilation shaft. To the right is a longer passage about 1mhigh and 12m long. Close to the inner end is another ventilation shaft on the right. About the middle of the passage a side passage opens on the left. It is short and leads to a large chamber. This is flooded and close inspection is not possible. However it appears to be about 3m wide and 5m long. Beyond it is the entrance to another chamber. Rathfran Park Wedge-tomb (G184332) is a good example of its kind. It has double walls, the outer wall being composed of massive stones up to 1.5m high and 2m wide. The tomb is about 7m wide at the front, 10m long and 4m wide at the rear. The burial chamber is masked by rubble at the front but is clear at the back. It is about 2m wide. A stone circle (G192334) near Rathfran was inspected. At least 13 stones remain and form part of a circle with great gaps. The largest of the stones is about 1m high and the circle is about 17m diameter. About 100m distant (G191333) are the remains of a smaller structure, possibly a tomb. 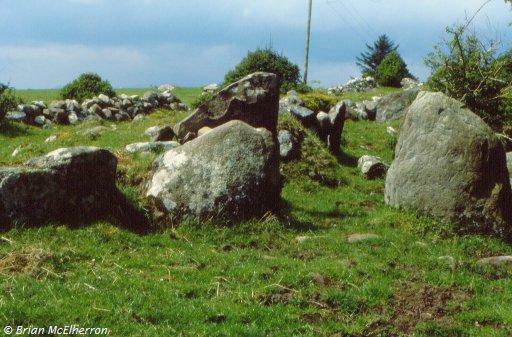 A megalithic tomb in Ballyglass (G098379) appears to be a full-court tomb with galleries at opposite ends of the court. Between them is a small structure which may be the entrance to the court. The structure is greatly ruined and the plan and extent of the graves are not clear. The second tomb in Ballyglass (G097381) is a large centre-court tomb with two two-chambered galleries leading from an elliptical court. The court is about 6m wide and 10m long and has a well-defined entrance. Two large capstones lie just within the court. The total length of the tomb is about 23m. At Doonfeeny (G086397) there is a standing stone about 6m high. It is slightly curved and about 40cm wide and 20cm thick. Near the base on one side is a Maltese cross and above this is a cross with expanded ends. This cross is about 60cm high. The stone stands in an overgrown section of an old graveyard. On the other side of the road is the ivy-covered ruin of an old church with some 18th century gravestones in the churchyard. 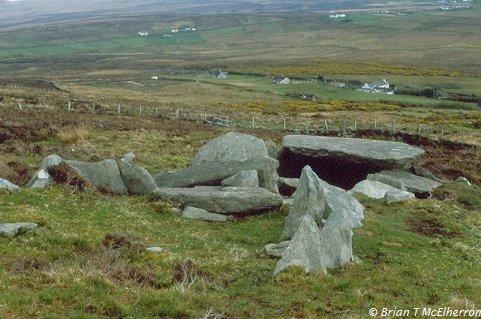 In Glenulra (G071406) are the remains of a small megalithic tomb with only five stones visible. Two of the larger stones form part of a chamber and a third stone forms part of the facade. A small mound near the rear may be part of the tomb. It is about 2m wide and 3m long. About 50m distant are the emains of a second tomb of similar size with a large slipped capstone. Also in Glenulra (G058402) is a small court-tomb. It is about 5m long and 4m wide. However it is mostly covered with peat and only the rear section can be clearly seen. 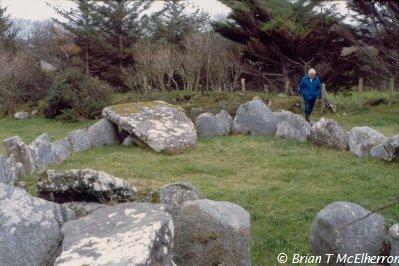 At Rossdoagh (F826384) there are two concentric stone circles about 10m and 16m diameter. Between the inner and outer circles are the remains of a small chambered tomb. The old church at Fahy (F752122) is a small rectangular structure with doorways in the north and south walls, both with hinge stones. There is a small window in the north wall and a larger rectangular window in the west wall. In the east wall is a small window with ogee head and some decoration on the outside. Inside the north door is a holy water stoup and there are ambries in the south wall at the east and west ends. The remains of two windows at the west end of the church may indicate a second storey. 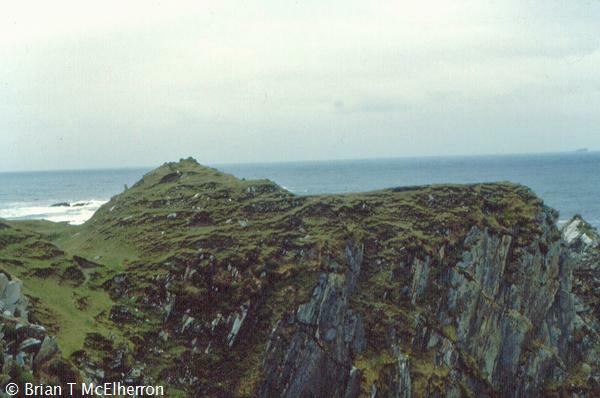 Fahy Castle (F754126), which is greatly ruined, was viewed from a distance. 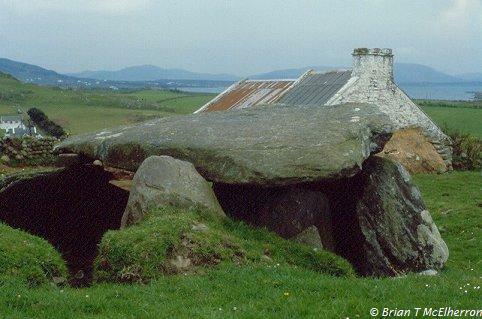 At Drumgollagh (F797049) there is a court-tomb with a two-chambered gallery. The innermost chamber has a large capstone and the chambers are separated by a slab which may be a slipped capstone. There is a well-defined portal with stones about 2m high. Remnants of the court survive but some recumbent stones here are not part of the original structure. The total length of the tomb is about 8m and it is about 3m wide. The outer burial chamber is about 3m long. Carrickkildavnet Castle (L719941) is an early tower-house set at the water's edge. It is about four storeys high and stands to full height. There is no stairway from the ground or first floor levels and access to the upper storeys was not possible. It is vaulted above the first floor and a hole at the corner of this vault is the only access to the higher levels. There appears to be a small mural chamber at the first floor. The tower has a machicolation at roof level in the middle of the three walls on the landward side. At one corner is the base of a short stretch of bawn wall with remains of a round flanking tower. The castle has many small defensive loops with larger windows at the higher levels, including one over the doorway. Some of the loops have slopstones which are visible from the outside. A promontory fort (L720935) was investigated. It consists of a semicircular bank about 5m high outside of which is a deep ditch. The diameter of the bank is about 15m. Dunbunafahy Promontory Fort (L685958) is surrounded by steep cliffs on three sides. On the landward side is a deep ditch and a high bank of stone and earth. In the middle of the bank is a small cist grave. Part of the fort on the seaward side seems to have disappeared exposing bare rock. In Keel East (F649076) there is a court-tomb with three possible chambers. A good capstone about 2m long and 1.5m wide covers the innermost chamber. The total length of the gallery is about 5.5m. The court is full and measures about 3.5m by 4m. None of the stones is very tall. Another chambered tomb in Keel East is more ruinous (F646073). It consists of three large slabs two of which are more than 2m long. There are a number of other large stones including one about 2m square which may be a capstone. The exact nature of the structure is not clear. The deserted village of Slievemore (F638075) was investigated. Two groups of derelict houses extend over about 2km. The houses are all approximately the same size, about 4m by 7m externally. There are a number of variations; some have two opposing doorways, just off centre, in the long walls; a few have small window openings; several have no windows; some have a drain running between the doors; some have ambries in the gables; there are no fireplaces. A castle (G152097) was investigated. Only a small fragment of a wall remains. A holy well and church are noted nearby (G155105). The location of the well is not clear. A dry stone-lined pit is possible but there is a spring closer to the lake. The church is a small rectangular building with a pointed door in the south wall. High on the west gable is a small rectangular window and the east gable is almost entirely missing. The gravestones are mostly late-19th century and modern. A rath was investigated (G126148). It is about 25m diameter with a good bank and faint traces of a ditch. Rathnacourtia is greatly mutilated (G130155). About one third of the bank is missing and quarrying has removed a large section of the platform. It is about 18m diameter. A large rath-like structure (G105151) was inspected. It is about 30m diameter with a low bank broken in a few places. There is no outer bank or ditch. Carrowkilleen Court Tombs (G083168) are set within a huge cairn and there are at least three courts and possibly four. At one end of the cairn is a large double-court tomb with one of the galleries having a side chamber. At the other end of the cairn, and separate from the larger structure, is a single-court tomb with half the court remaining. The area between the galleries in the double-court tomb is confused. It is possible that there is here a smaller double-court tomb and a single-court tomb. The total length of the cairn is about 50m. A number of raths were investigated as follows:- G342283: a rath about 18m diameter with an eccentric hut circle or house platform about 4m diameter; G461334: a simple rath about 30m diameter with no traces of an outer bank or ditch; G470330: a rath about 30m diameter with a platform about 3m high; G472332: a large rath-like enclosure about 65m diameter with a well-preserved bank with six openings. The bank is about 1.5m high on the inside and 4m high on the outside; G519327: a mutilated rath about 40m diameter with some traces of an outer bank and ditch. The rath is inside a much larger enclosure about 100m diameter bounded by a low bank; G760278: a rath about 25m diameter with a single bank which is missing in one corner. The rath platform is very marshy.